This project was funded by the European Science Foundation and involved eight research teams. It ran from 2007 to 2012. It was preceeded by the explorative project Networking Europe and succeeded by the synthesis project Europe's Infrastructure Transition. 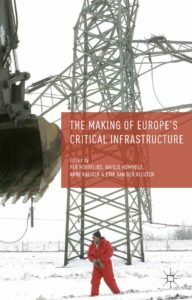 The Making of Europe's Critical Infrastructure. Common Connections and Shared Vulnerabilities. Editors: Högselius, P., Hommels, A., Kaijser, A., Vleuten, E. van der. London/ New York: Palgrave, 2013. For ToC see Publisher's website. Read the 'last author version' of the book introduction here. EUROCRIT takes as its point of departure a novel approach to the study of critical infrastructures, by reconstructing the long-term historical emergence and evolution of these. It takes as its point of departure the expansion of infrastructures in Europe both through the interconnection across national borders and through interconnections of different kinds of infrastructures with one another. Those connections created new forms of interdependencies and shared vulnerabilities among nations in Europe. The project inquires how actors of different kinds have interpreted such interdependencies and vulnerabilities, and developed institutions for handling them. This enables us to contribute novel ideas both to historical studies of infrastructures (adding the notion of vulnerability as well as a pan-European perspective) and to more policy- and practice-oriented research on critical infrastructures (adding the historical dimension). The project consists of six Integrated Projects and two Associated Partners, from institutes and universities from eight countries.The projects primarily focus on European energy infrastructures (emphasis on gas and electricity), nuclear energy, communication systems and cybernatization. Collaboration in the project takes place through a series of workshops (two per year), which are prepared in such a way as to use them for constructive work on an edited volume. The edited volume will be the single most important result from the research carried out within this CRP, and it is also the main end product of our intra-CRP collaboration. The editor team consists of Arne Kaijser, Per Högselius, Erik van der Vleuten, and Anique Hommels. Each IP and AP will also produce its own products in the form of articles or books. Furthermore we also foresee that some articles will be co-authored by researchers fromdifferent IP/APs. First project meeting in Utrecht, the Netherlands.